Did you like our blog post? What are Partner Visa application stages? I’m confused about the Partner Visa Stages 1 and 2? First off, please don’t stress. Many people get confused about the different stages so we will explain them here. When you apply for a Partner Visa, either the Subclass 309 (Offshore Partner Visa) or the Subclass 820 (Onshore Partner Visa), you will go through two ‘stepping stones’ on your journey to securing Permanent Residency. (Please note this advice EXCLUDES the Prospective Marriage Visa (Subclass 300) process which involves an EXTRA stepping stone and we’ll address that in a separate video). If you are going for the Subclass 309, your first step / stage 1 is to apply when you are OFFSHORE or OUTSIDE Australia. Alternatively, if you’re INSIDE Australia, you will be applying for the 820. In both case and unbeknownst to you, when you first apply for either the Offshore or Onshore Visa, you’re actually making a double application. What this means for you is that you’re in fact also asking Immigration to consider you for the second stepping stone, the Permanent Partner Visa Stage, which happens later down the track. There’s nothing extra you need to add to get the second stepping stone started. However, even though you may be unaware of this, keep in mind that you are indirectly applying for the Permanent Partner Visa at the same time. 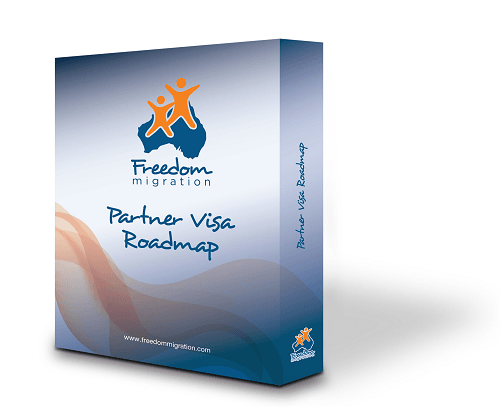 Download our free Partner Visa Roadmap and use it to do a self assessment of where you are at in the process. Try filling out as much information as you can and see if you have everything that is required. So, I’m applying for both Visas at the same time? Yes, that’s effectively how it works. Your first step is to apply for the temporary or provisional Partner Visa. To recap, you would go for the Subclass 309 Visa if you’re OUTSIDE Australia and the Subclass 820 Visa if you’re INSIDE Australia. These are both temporary / provisional Partner Visas. And then, two years from your date of application for either one of these Visas, the Department of Home Affairs / Immigration should reach out and inform you it’s time for you to prepare for the Permanent Partner Visa. As mentioned, you’ve already applied for it two years prior, but they just haven’t asked for an update or evidence for it. So, please remember, that two years from the date you lodged the first stepping stone for either the ‘309’ or the ‘820’, Immigration will start to consider you for the Permanent Partner Visa. If you lodged from OUTSIDE of Australia, your Permanent Partner Visa or second stepping stone / stage 2 will be the Subclass 100 Visa. If you were INSIDE Australia when you first applied, your Permanent Visa or second stepping stone / stage 2, is the Subclass 801 Visa. Will Immigration contact me once the two years from the application date is up? Unfortunately, there have been cases where the Department of Home Affairs / Immigration has not reached out at the two year qualification mark to advise that it’s time to provide the required evidence to support the full Permanent Partner Visa application. And so we would strongly advise you to seriously keep in mind that two year anniversary date, the date two years ahead of your first Visa application. Mark it on your calendar, set a reminder to contact the Department or reach out to us at Freedom Migration and we’ll advise you on what to do next. We hope you found this information useful. Please feel free to comment, we love getting your feedback and will reply to any questions you may have. Please Note: This does not constitute immigration advice. Always seek advice from a Registered Migration Agent before applying for an Australian Visa. Migration Law is constantly changing. This information is accurate only at the time of publication. I am applying for a partner visa from outside of Australia (309) do I need to wait till the second stage after two years before I can live in Australia or can I move there after stage one is approved? Hi Lopha, thanks for your question. If you were granted the 309 Visa then you could move to Australia immediately. When are you planning on applying for the 309? My Prospective Marriage Visa (Subclass 300) will be expiring by Feb 2019, my partner and I got married this Dec. 2018 which visa should I be filing next? is it the 820? Hi Lyn, thanks for your question. Subject to you meeting all the other criteria the Subclass 820 would be the next step. I am the founder and principal migration agent at Freedom Migration. I am extremely passionate about uniting partners and families with their loved ones overseas. It might be because I’m the product of a partner visa family. What’s next after the Prospective Marriage Visa? Forms 47SP and 40SP – When to fill them in? Will Immigration ACTUALLY check my Social Media? © Freedom Migration Pty Ltd (ABN 64 105 094 598). All rights reserved.